Unrecognized by many countries, unable to secure their borders, a struggling economy in a world already in crisis- the laundry list of problems that Kosovo faces can easily be called daunting. But in the face of so much adversity there are some exciting things happening and one source of excitement in Prishtina is the new media project called Kosovo 2.0. I visited some of the talented people at K2.0 a few weeks ago during a brief visit this month. As a first time visitor, I had many questions about almost everything, from politics, to history, from education to entertainment. It may be a small place but it left a big impression on me. In this podcast I sit down with the editor-in-chief of Kosovo 2.0, Besa Luci, a clear thinking journalistic mind who gave me the impression that no question was out bounds. I was also joined by deputy editor, journalist, and global wanderer Nate Tabak. Together as my two guests, they tackled all my sometimes elementary questions that many people around the world are also wondering – What is it like to be alternative press in such a troubled land, what is happening in Kosovo today and how does this special media outlet help make a better future? 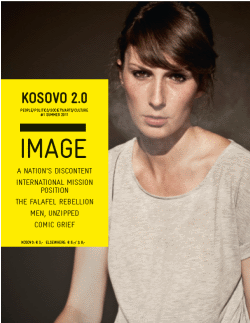 After listening please to go and read and experience Kosovo 2.0.